And finally, we reach the twelfth and final beer of our Ardennes winter retreat, which was the red-foil covered Postel Dubbel. It’s a dark beer produced by the De Smedt/Affligem brewery (also called Op-Ale brewery and owned by Heineken), who also make Affligem, which I quite liked. 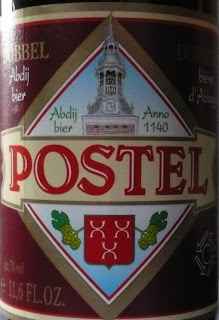 Postel Dubbel is very good. It starts with a very inviting pillowy head on top of a gorgeous nut brown liquid. The mouthfeel is fluffy, and the taste is all the regular brown ale tastes -- caramel and burnt molasses etc -- but with flavours of nutmeg and fruit. Blackberry or plum, I think. The aftertaste is hoppy. 7% alcohol. This one is actually not to difficult to find either, so I think I’ll be having this one again soon.